I got back in the country from my Spring break trip already almost 2 weeks, but I haven’t yet baked any bread. As soon as I arrived 2 Saturdays ago, I only had enough time to distribute the gifts, straightened out my luggage, got a few hours of sleep and left the very next day heading up to the mountains –without forgetting to feed my two starters (white and rye)–. 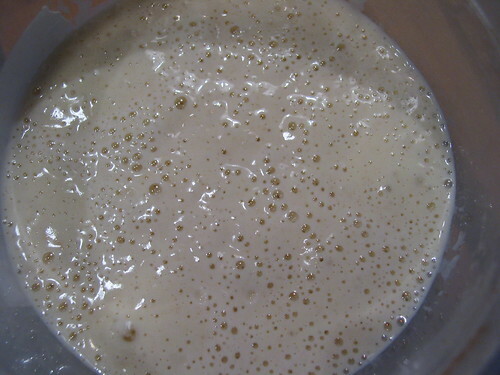 I created this white starter last September and it has since risen consistently many loaves of bread. 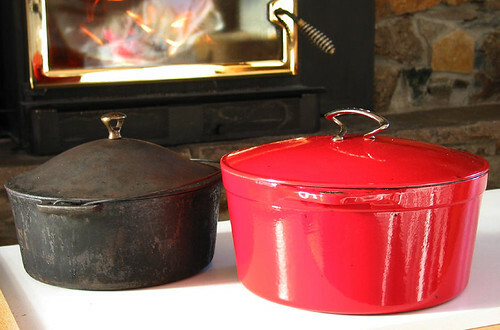 Before I set up the oven with baking tiles & lava rocks for steam I used to bake all my bread in lidded cast-iron & lidded Pyrex pots. 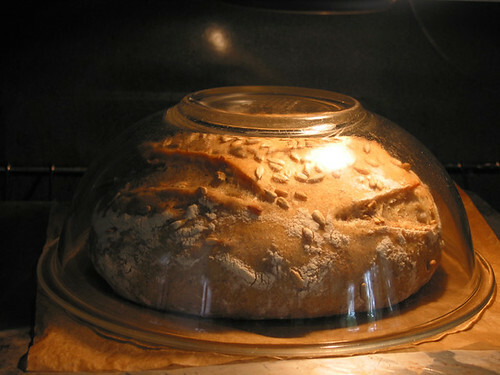 In the beginning of my baking adventure and out of curiosity, I’d tried all sorts of suggested baking method, including this fairly dangerous one but it worked quite well –I believe by Susan of San Diego posted on The Fresh Loaf –a pre-heated inverted Pyrex bowl over the loaf–. I am visiting at 7200 feet above sea level so I won’t even attempt to bake any bread even one with commercial yeast; although I must confess I thought about bread baking quite a bit in the past few days. To relieve my hunger for baking I am going to post this Simple Sourdough also by Susan SD (stands for San Diego) whose recipe I’d made a number of times and liked it very much. 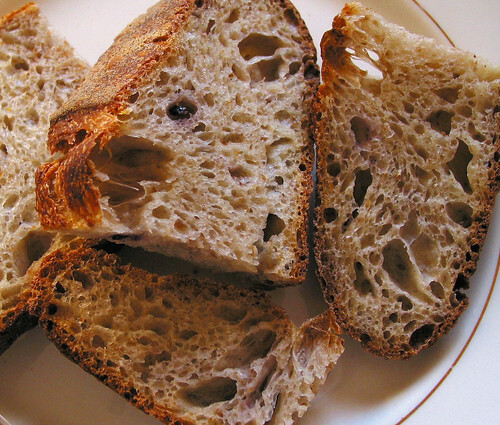 What appeals to me is its simplicity, from 4 simple & basic ingredients: sourdough starter, white flour, a small percentage of rye/whole wheat flour, salt and water to its flexible mixing, shaping & baking method. And it tastes delicious. Of course you can mix in seeds if you know what you are doing and don’t have to bake in a lidded pot. For this particular loaf I threw in about 3 Tablespoons of ground flax seed and dried blueberry — purchased from Trader Joe’s– for some color as well as taste. Mixed all ingredients minimally by hand and let it rest for 30 minutes. Do 1 Stretch & Fold, then 2 more S&F at 1-hour interval. Let it rise at room temperature 70°-72° F until double. 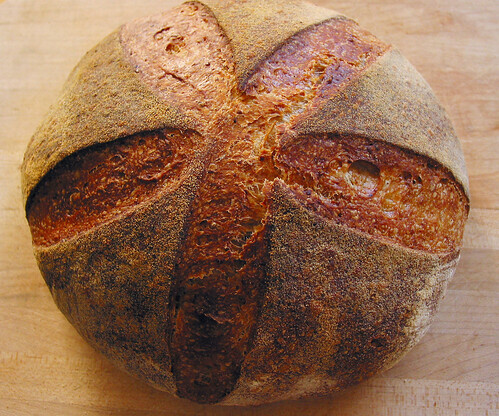 Pre-shape, rest loaf 15-20 minutes, then shape it into tight boule. 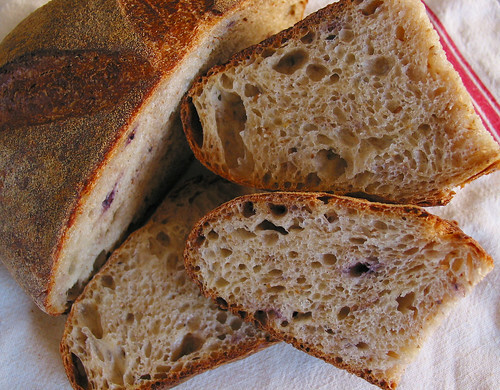 Place the loaf in a linen-lined container about 2.5 times larger than its size. Cover it well with quick saran wrap, and place in the fridge overnight. Take it out the next day & warm it up for 2 hours at room temperature. Pre-heat oven with a closed lid cast-iron pot at 475 ° F, at least 45 minutes before baking. Score the loaf, place it in the pre-heated pot, close the lid and bake for 20 minutes at 450° F. Remove lid and bake for another 20 minutes. I take the loaf out of the pot and bake it in the oven for the required amount of time & turning it 180 degrees half way into baking for an even bake. Turn the oven off, crack the oven door open and leave the loaf in for another 5-10 minutes more. Cool it on rack for 1 plus hour or so before cutting it. Enjoy. I am sending this bread to this week’s Yeast Spotting. Go visit the site, even if you don’t bake bread, it’s a feast for the eyes, and maybe you would change your mind afterward.